President Salvador Sanchez Ceren arrived in Cuba for his second official visit to the country. Oct 24 (teleSUR) “We will always keep fighting to end the blockade. It’s an unfair decision against the people and has not allowed Cuba to develop,” said the Salvadoran President Salvador Sanchez Ceren on Tuesday after visiting Havana as part of his official visit to Cuba. “We backed Cuba in the recent sessions at the United Nations General Assembly, we’re about to take part in other forums and we will backing the demand to stop that unfair blockade that the United States has imposed on the Cuban people,” Sanchez Ceren told the press. The Salvadoran president was welcomed at the Jose Marti International Airport by the Foreign Affairs Deputy Minister Rogelio Sierra on Tuesday and will remain in the island until the 27th. In 2015, Sanchez Ceren visited Cuba to establish 12 cooperation projects between both nations in the health, education, and economic realms, seven of which have already concluded. El Salvador and Cuba restored relations in 2009 during the presidency of Mauricio Funes, from the Farabundo Marti National Liberation Front (FMLN), when Sanchez Ceren was vice-president. “This nine years of relations have strengthened the friendship between both peoples, having a long tradition in common, and the Commander in Chief Fidel Castro is at the center of it. He worked a lot for El Salvador and that was recognized by our people,” said Sanchez Ceren. 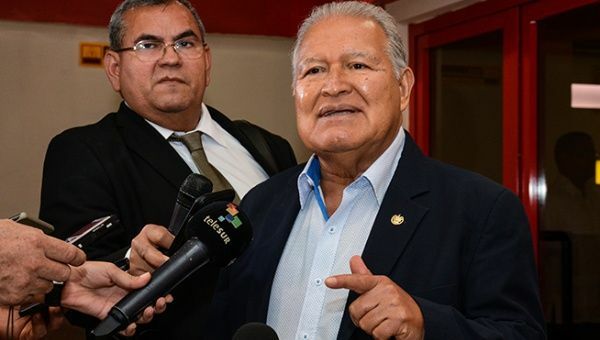 The Salvadoran president said that since the diplomatic ties were restored there’s been an intense effort for cooperation between both countries, aiming to reach a coordinated common action in Latin America. He especially thanked the ‘Operation Miracle’ (or Mission Miracle) an international effort led by Cuba and Venezuela across the continent, thanks to which more than 20,000 Salvadorans have recovered their eyesight and 108,000 consultations have been carried out. He also pointed out that 330,00 people have learned to read and write thanks to the ‘I Can’ Cuban educational method. The president took the opportunity to express his solidarity with the immigrant caravan that’s finding its way to the United States through Mexico against all adversities, in search for political asylum.